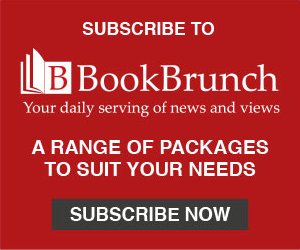 In 2018, the UK book market saw growth across print, audio and ebooks, with physical and digital proving they can co-exist and thrive alongside each other, as readers decide which formats work best for them in different situations. We have some readers that have switched completely to one format – ebook consumers aged 55+ show the highest tendency to have stopped buying print in favour of ebooks, while 30% of audiobook consumers report reading fewer print books since they adopted audio – but many of those that are buying digital formats are still swayed back to print in certain circumstances, whether stemming from price, author, genre or intended use of the book. For those ebook consumers that buy both print and ebooks, 48% of those surveyed would still choose a print book for study/work, closely followed by 45% choosing print for a favourite author. On the other end, a similar share said they would choose an ebook for commuting/travelling, and 39% would go digital for an author they haven't read before. We asked audiobook consumers a similar question, and 42% of those that still use print or ebooks along with audio said they would stick to reading rather than listening for a favourite author or genre, as well as for a holiday read. And as with the ebook results, audio consumers ranked commuting/travelling as the primary circumstance in which they would be more likely to listen to audiobooks. If we focus on those that have increased their ebook or audiobook consumption in recent years, the same general pattern emerges, with commuting/travelling as the most popular driver for choosing ebooks or audiobooks, as shown in the graphs. 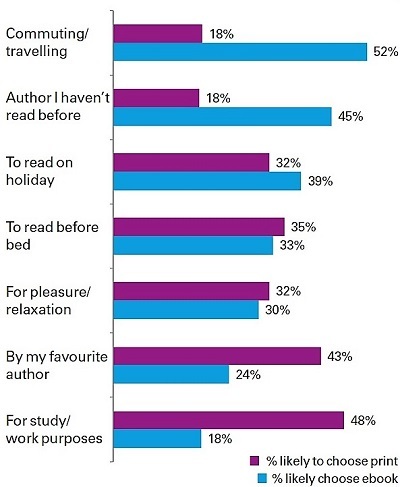 An unfamiliar author and a holiday read skew more digital than print when it comes to ebook buyers, but even those that have increased their ebook buying show a preference for physical books when it comes to relaxing, reading before bed, buying a favourite author and especially for study/work. Contrarily, for audiobook consumers that have increased their listening, they're more likely to choose audio for pleasure/relaxation and for before bed, along with for an unfamiliar author or genre. As for a favourite author or genre, the respondents who would choose an audiobook only just outnumber the ones that would choose a print/ebook. 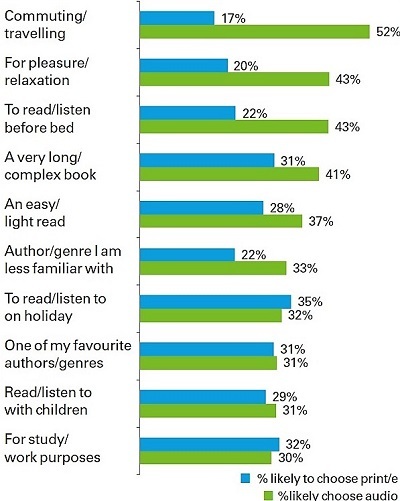 Only a couple of situations see preference for reading edge ahead of listening for these consumers, with 35% saying they would be more likely to choose a print/ebook to read on holiday and 32% saying the same for study/work purposes. Price proves to be the unifier for both ebook and audiobook consumers. Unsurprisingly, in both studies, the majority of respondents said they would choose the cheaper format, whether that be print, ebook or audio. But when prices are the same, 37% of ebook buyers that still buy physical books said they would choose the print book, with 21% going with the ebook. Audio consumers weren't as decisive: 40% agreed that they were equally likely to choose audio or print/ebook if prices were the same, with 33% going with the latter in that situation. Jackie Swope is publisher account manager, Nielsen Book Research. This article includes insights from two of Nielsen's 2018 deep dive studies: Understanding the UK Audiobook Consumer and Understanding the UK E-Book Consumer. Both are available to purchase; please contact infobookresearch@nielsen.com for more information.